The Cleethorpes Beach Safety team sent their Land Rover to rescue their own stranded 6x6 from the incoming tide but both vehicles ended up submerged. 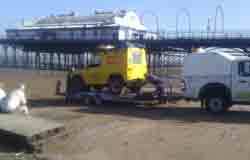 The patrol's six-wheeler got stuck approximately a mile out from Cleethorpes Pier in North East Lincolnshire. The team's yellow Land Rover Defender 90 was sent out to rescue it and became stranded as well. The embarrassed patrol members, walked to safety as the tide came in and dialled the Cleethorpes Lifeboat for help but, for practical reasons, this request was refused. Unsurprisingly the red-faced members of the Beach Safety Team declined to comment.